Written on November 16, 2006, and categorized as Secret and Invisible. It was one of those silly threads that just come from nowhere and end up with a new saint. 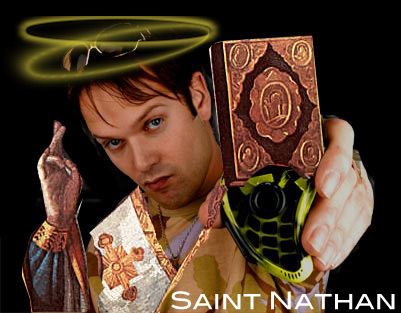 The man beatified was Nathan Barley, that fabulous comic invention. We love you, Nathan, Patron Saint of Podcasters. You make us laugh like hyenas on a portable music player. My Psychedelic Shed It wasn't like that last night, thought the man, as he lifted his head and looked towards where the noise was coming from. A torch shone in the dark, making him squint.